Polaris RDF is a radio detection finder (RDF) manufacturing company locally owned and operated in Dana Point, California. We assist government agencies and organizations with locating emergency radio beacons through the use of RDFs. Many different government agencies such as search & rescue, law enforcement, and the military can use our products for their RDF needs. 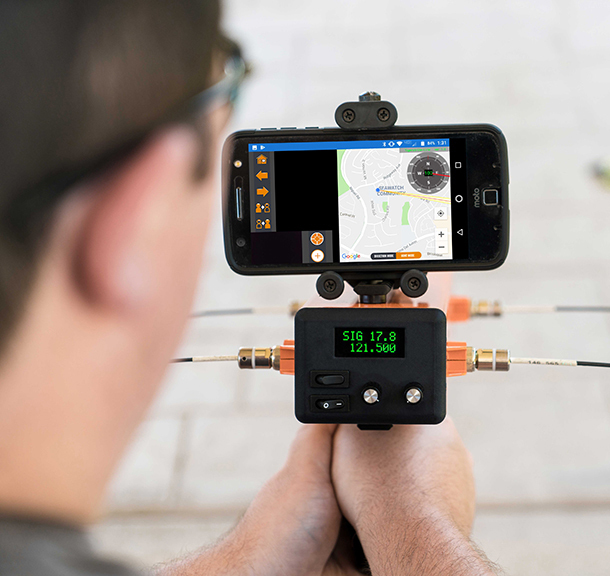 Polaris RDF offers a 121.5 MHz RDF that can be operated by using a handheld RDF device or a drone-mounted RDF. Polaris RDF is devoted to providing government agencies and organizations with reliable RDFs to increase reaction times to emergency signals. We take pride in attention to detail and exceeding customer expectations with our Polaris RDF products to be time-effective and cost-efficient. 121.5 MHz beacons are designed to be used as a tool for first responders to react to a distress signal that is being transmitted with 2.5-5 degree accuracy. The Polaris RDF is an Android software system that is field tested and utilizes radio-based emergency beacons using the GPS locating mapping system. With a pair of AA batteries, our RDF system lasts up to 10 hours. Antennas on RDFs are sensitive to signals when the antenna is significantly long enough to detect large wavelengths. Generally, antennas are about one-quarter of the wavelength it is perceiving, and at Polaris, our handheld RDFs and drone mounted RDFs have the capability to receive an array of emergency transmissions. On November 9, 2018, the FCC released their FOURTH REPORT AND ORDER on the eventual transition from the existing 121.1 MHz Emergency Locator Transmitter (ELT) to a newer, 406 MHz version. This long document boils down to this: 406 MHz ELT’s are coming, but, existing 121.5 MHz ELTs may still be used until November 6, 2026. Read the FCC Synopsis HERE. Call 1-844-812-7393 to contact Polaris RDF and speak with an Expert about your department’s RDF needs. Subscription to Polaris RDF ensures software is up to date with the latest maps and technologies. Software triangulates location and plots location on maps. Delivers GPS location for both 121.5 MHz and 406 MHz Frequency Beacons. 24/7 full-service software and technical support.